Linked to over 2000 miles of inland waterways the marina attracts many visitors from all walks of life including Cyclists, Anglers, Walkers, and Boat Owners. Located just a few miles from both the M6 (J27) and M61 (J6). The Marina boasts a choice of facilities including new and used boat sales, over 100 moorings, a large chandlery shop and the superb marina cafe. Whether it’s fun and excitement, industrial heritage or spectacular scenery you’re looking for the marina will provide a gateway to them all. We also have 10 fully services touring caravan pitches. The idea stopping off point if heading north the the Lake District or Scotland. Whether you’re a boat owner or just keen to find out more, you’ll enjoy a warm and friendly welcome, White Bear Marina provides the perfect choice of facilities and convenience. 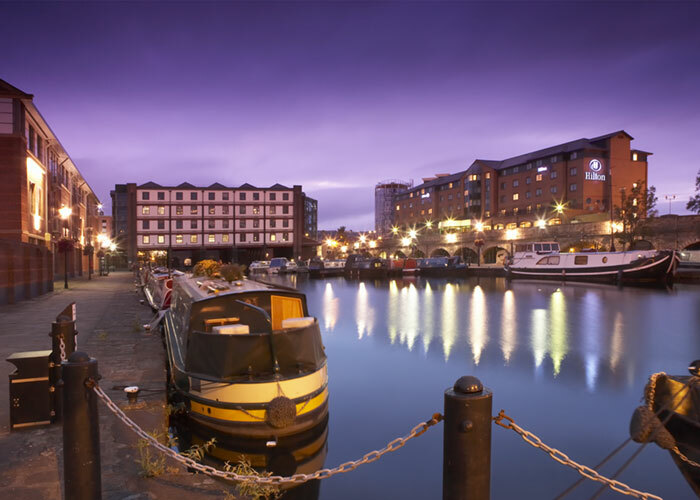 The Leeds & Liverpool Canal’s unique charm reflects the beautiful countryside, towns and villages along its bank and makes it an attractive route for narrowboats, walkers, cyclists and anglers. Whilton Marina has mooring facilities for approximately 200 boats, each berth has 240 volt hook-up with all piers having water taps. Our aim is to try and offer mooring on a temporary basis to everyone who buys a boat from us. Longer term moorings are dependant upon availability and are at the discretion of the marina owners – just ask at the time of purchase for more information. 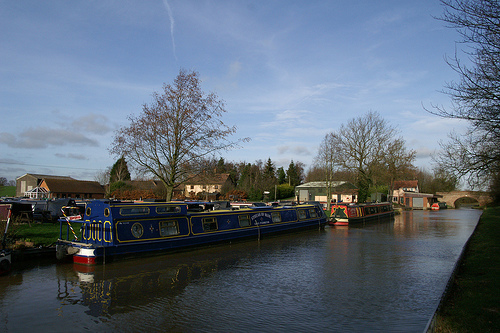 Whilton Marina is located beside Whilton Bottom Lock at the foot of the Buckby flight. It was built in 1971 by David Steele who had a background in construction and civil engineering but no previous connection with the canals. At that time there were no services here and the site was just an empty field between the canal and the railway. Seeing the business potential of a site so well placed on the waterways network, and having the skills to manage the digging out of the large marina, David Steele acquired the land and established the marina. The water space is still the same size as when the marina first opened although buildings and facilities have been added over the years.The marina is still owned by Steele family and is now in the hands of David Steele’s two sons, Nigel and Richard. I spoke to Richard Scowen, the Sales Manager at Whilton Marina, who explained the history and present day operations of the company. It started off as general moorings and then, very soon after the marina was built, boat sales were started. There was a period in the 1970s when they constructed fibre-glass river cruisers. This only lasted for about 3 or 4 years as it came at a time when canal boaters were turning from plastic to steel. 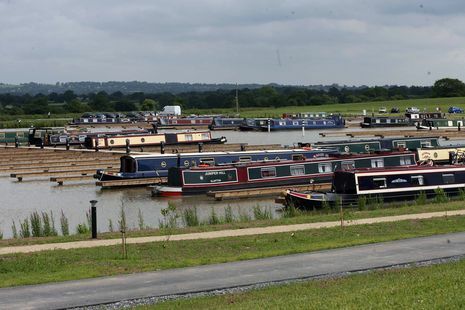 In addition to the boating side of the business they have storage for 450 caravans at Whilton and also own Cosgrove Park – a 180 acre caravan and leisure park next to Cosgrove Lock. The facilities at the marina are impressive and include two slipways, two wet docks and access to all the usual engineering facilities as they have an electrical engineer, gas engineer as well as general diesel engineers. There are eight people employed on the engineering work. Over plating, boat stretching and major repairs are done by contractors on site. They now have three boat fitters on site – Evolution Narrowboats, Ebony Narrowboats and Geoff Corbett who was about to retire and in September 2003 and was finishing his last narrowboat. The Sales Office also represents two other manufacturers of new boats – New Boat Company and George Morris Narrowboats. I received an email today, reproduced in its entirety below, which voiced concerns about the way that Whilton marina operates. Coincidentally, I was given the same information yesterday by a boat builder. I have no proof that the claims are true. I have included the information here so that you can make up your own mind. “It is all very well promoting Whilton as a broker but if you are seeking to provide good impartial advice to others you should be aware of some things they don’t advertise. They don’t reveal it to a buyer either. Not until the money has changed hands and the buyer receives a Bill of Sale showing the vendor to be Whilton Marina Ltd does this become apparent. It also means that as a trade seller they are bound to offer a warranty. As far as I know they do not. Some former customers of theirs tell me that they even go through a routine of pretending to contact the owner when negotiating an offer. I recall that somewhere recently you stated that there is no VAT on the sale of a second hand boat. In fact, when a second hand boat is sold in the course of business this is not true and there will be VAT payable on the margin. Not such an issue for most, unless they want to take the boat to another EU country. As there are a number of narrowboats now bobbing around the waterways of France, Belgium and the Netherlands this should be highlighted. The member state may well insist on evidence of VAT paid status, both when purchased new and subsequently if a Bill of Sale shows the owner to be a business. This would apply to many of the boats sold at Whilton. A professional broker will belong to either the Boat Retailers and Brokers Association division of the British Marine Federation or to the Association of Boat and Yacht Agents. Both have a similar Code of Conduct including the need for a Client Trust Account for customer funds. The broker has to prove that they operate such a protected account. Whilton are not a member of any recognised brokerage body. The Chandlery Shop, (I am lead to believe) is now run by the owners of Whilton Marine. Richard Sailliate has moved his business to Rugby and still trades under the name “The Canal Shop” in his new premises. He has NO CONNECTION whatsoever with the Whilton Marina operation. Welton Hythe and Welton Haven are set in open countryside just a short distance from Norton Junction. Being at the heart of the canal system, our customers have a vast choice of cruising routes whether for weekend or longer use. Easy access from the major motorway and rail networks mean that your weekend can be spent on your boat and not in your car. We have a resident caretaker – who can be contacted in the event of an emergency, and provides extra security for your boat. Our moorings facility is a modern purpose built marina with non-slip staging walkways, easy car parking and full marina facilities set in a landscaped environment. The marina at Welton Hythe is the home of Weltonfield Narrowboats on the Leicester Section of the Grand Union Canal about half a mile from the main line at Norton Junction. It is a base that offers a good choice of cruising routes as it is less than a days cruising from three other major canal junctions at Gayton, Braunston and Napton. The day to day running of the business is in the hands of Sarah-Jane Page and her brother-in-law Nick Mellor who are both directors as are her parents Hugh and Judi Mayes who founded the company in 1975. When Sarah-Jane was a child the family had a holiday on a narrow boat called Sir Tarquin from Countrywide Cruisers at Brewood and went up the Llangollen Canal at Easter. It snowed and they built a snowman on the roof of the boat but this does not seem to have put the family off canal boating. Her father was coming out of the air force at this time and decided that boating would be a nice business to get into. When driving up the A5 one afternoon he saw a for sale sign for the old disused farm that is now the marina. He bought the canalside property with no planning permission and then fought to get planning agreement, having to go to a tribunal to get approval to start the business. They had a couple of hire boats built by Harborough Marine over one winter and another two the following winter. The original hire fleet was run from a small inlet in the canal bank which they built for the first four boats. Hugh Mayes then decided they could build their own boats. They went to Hancock & Lane for the hulls and started fitting-out in about 1978. They then expanded to six boats then, at its height, they had eight hire boats plus two boats that they ran for the airforce RAF Cottismore and RAF Wadington and a spinal injuries boat for the disabled which they built and hired out. Over the winter of 1985 they built a new marina which they flooded in January 1986. 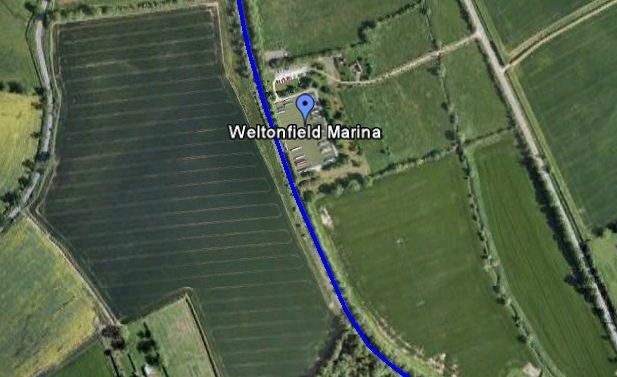 They built a second marina close by at Welton Haven in 2000. There are now only three boats in the hire fleet as this area has declined and the marina has taken over as the biggest part of the business. The mechanics, painters and carpenters that are needed for the hire fleet are still on site and available to do servicing, refits and painting for people using the marinas. They also build about four bespoke boats each year using Graham Reeves hulls. They have approximately 200 moorings on the two sites at Welton Hythe and Welton Haven. Moorings are charged by the foot and moorers can pay yearly, half-yearly or quarterly. There is water and electricity on all the pontoons. The Welton Hythe marina has only recently been upgraded to have water on all the pontoons, previously they were on a spring water supply but now they have mains. A lot of customers have been with the marina five or six years and some since the marina opened. The usual diesel, pumpout and gas supply services are provided but there is no laundrette or showers on site. However, they do offer a boat cleaning and laundry service to customers which is a much less common service. There is not chandlery shop on site as they are not on the main line and Braunston and Whilton are close by so they would to get sufficient turnover to compete. For security and general site maintenance they have full time caretakers. Someone is always on each of the sites and the gates are locked out of business hours. Viking Marine – sits at the end of the Aire and Calder canal in Goole, where the inland waterways meet the tidal rivers of the Ouse and Humber. The Marina’s secure moorings provide a home to a diverse flotilla of yachts, power boats, barges and converted commercial vessels. Facilities include a 20 Ton hoist, Dry Standing, Diesel and a Large Chandlery. We can also provide you with a range of Maintenance and Repair Services. 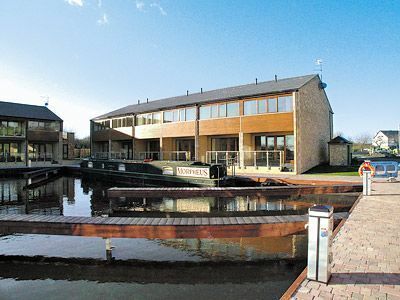 Trinity Marinas is a well established narrowboat marina situated on the Ashby Canal in Leicestershire. Its Heart of England location, served also by a superb motorway network, makes it extremely accessible from all areas of the country. Trinity Marinas is a large and well laid out marina with 114 moorings for narrowboats from 40ft to 70ft on sophisticated pontoons. With its modern facilities it can offer services second to none. Trinity Marina is situated on the Ashby Canal giving access to over 38 miles of lock-free cruising, or more than 53 miles if we discount the stop lock at Hawkesbury. This fairly new marina was the dream of Bob Woodward, the owner of Trinity Motors and of the adjoining canalside land. He and his daughter Sharon Woodward planned and built the marina which was completed in 2001. It is Sharon and her partner Christine Dallas who run the marina business. Christine has been a boater since her early twenties. Her first boat was a Shetland cruiser and this was followed by a wooden canal cruiser before she acquired a 50 foot ex-Weltonfield hire boat called Buttercup which she kept on the Ashby Canal for 4? years. She joined the company six months after the marina opened with a background in retail, commercial and marketing work which together with her boating interests made her a prime candidate for being partner to Sharon Woodward. Christine’s first job was to fill the 120 berths in the marina with narrowboats, which happened quite quickly and they now have a 200 boat waiting list for moorings. After the moorings were full they started a second hand boat brokerage service and have sold about 130 boats in the 18 months it has been operating. The moorings all have electricity and water and there is a launderette, modern shower room and toilets on site as well as a shop and small chandlery. Although they have no engineer on site they are close to Willow Park Marina that has these facilities and are in an area well served by marine engineers. 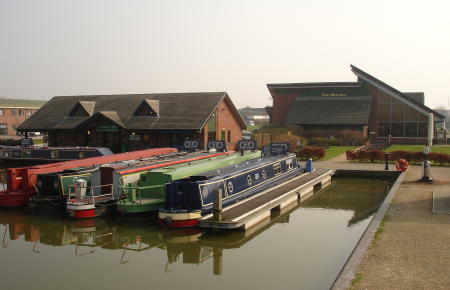 In addition to the usual boatyard services such as diesel and pump out they are also the first marina to offer broadband internet connection – from ukcanal.com – which gives a radio link in the areas of the site that is available to subscribers to the service. The development includes an a la carte restaurant and bar. They must have been impressed by the architect who designed their Watergate Restaurant as they are now using him to design the interiors of their range of new boats. The boats will be built using Graham Reeves shells and the fitting out is to be done by Ian Cooper at Aynho Wharf. There are three different styles that people can choose from: Scandinavian range which will be open plan with wood finishes; Contemporary Chic range that is a modern design; and New England range which is more traditional. Having someone from outside the boat building business doing the interior design has produced some new ideas including, on two of the ranges, central island kitchens which are very unusual on boats. At the time I spoke to Christine these plans were still in the design and concept build stage. They plan to produce 3 lengths in each of the ranges – 47, 57 and 67 foot. They will be standard boats with some customer choice within each style and will be available in Cruiser, Semi Trad and Traditional backs with a choice of three external paint colours. They were then making the final costings and aimed to start selling these boats in 2005. I was shown the plans of the nine different layouts – 3 lengths each in three styles. For those requiring something less expensive than a new boat the brokerage service is there to provide cheaper options as Sharon and Christine “want Trinity to be something for everybody”. If you are looking for advice they have produced leaflets such as Are you Buying Your First Boat which set out the average running costs. This is a marina that boasts all the modern facilities and a community spirit. 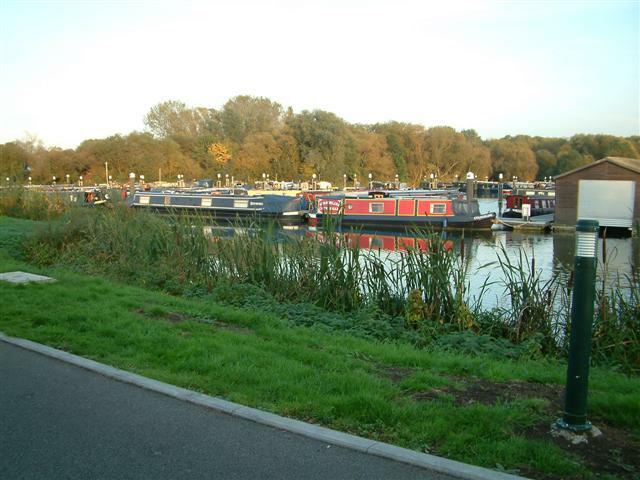 The Thames & Kennet Marina is based just outside Reading in a nature reserve and incorporates a narrow boat and cruiser marina. 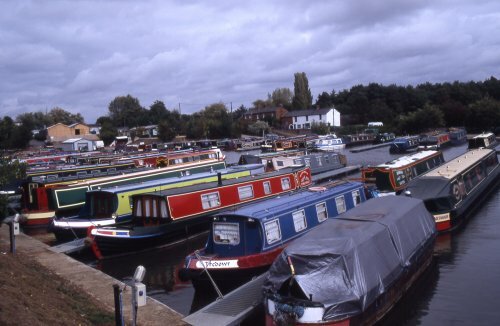 With the ability to cater for a number of types of boats, including Dutch barges, the facility is unique in the area and has the best access to the Thames River and Kennet canal. As a new facility, all amenities are up to date and as a part of the Tingdene Group of companies, standards are always high and maintenance and development ongoing. 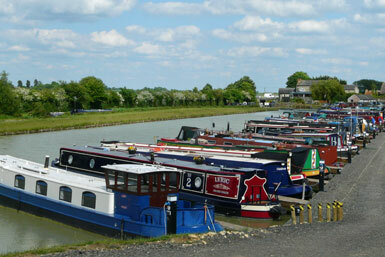 Tewitfield Marina is a purpose built hamlet with its own luxury holiday accommodation complex. Situated on the Lancashire and Cumbria border alongside Tewitfield Locks on the Lancaster Canal we provide our guests with the perfect place to stay with easy access to some of Britain’s best loved countryside, with both the Lake District and the Yorkshire Dales being less than half an hours drive away. Also close by is the historic city of Lancaster with its castles, museums and parks to visit and the seaside town of Morecambe, famous for its breathtaking sunsets across the bay and over the Lakeland Fells, as well as the beautiful villages of Arnside and Silverdale within an Area of Outstanding Natural Beauty. Within the immediate vicinity there is a welcoming country pub, the Longlands Hotel, serving real ale with a varied food menu. Just across the road is Greenlands Farm Village with its own farm shop selling crafts and local produce alongside a café where you can relax and sample fresh homemade food. 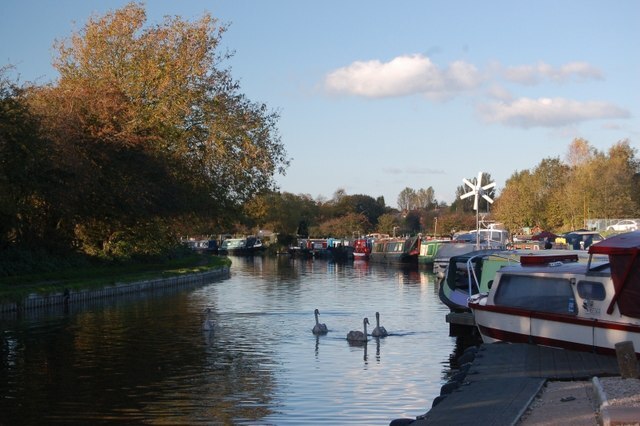 Tattenhall Marina is situated in beautiful Cheshire countryside with views of Beeston Castle and easy cruising to some of the most delightful stretches of the canal network, just seven miles from the centre of the historic city of Chester. Boaters will enjoy the same friendly, professional marina, offering the high quality standard of facilities seen at Great Haywood, with a comfortable members lounge, showers, laundry and well equipped workshop. The marina will create the appearance of a natural lake with soft margins and wetlands to provide habitats for aquatic birds and wildlife. Footpaths through woodland landscaping will be a special feature of Tattenhall Marina.